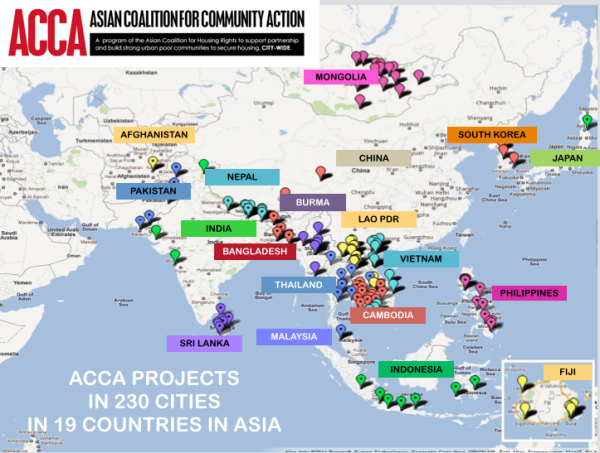 The ACCA Program (Asian Coalition for Community Action) is a three-year program which has set out to transform development options for Asia’s urban poor by supporting a process of community-led change in 150 cities in 15 Asian countries. The program’s activities build on established, successful models of people-led community development and are helping scale them up by repeated replication. Urban poor communities are the key doers in this process, as they tackle problems of land, infrastructure, social and economic development and housing at scale. The program began in November 2008. By 2014 it had expanded to 165 cities in 19 counties. 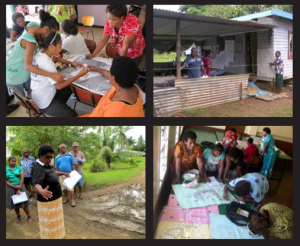 2014: The ACCA Program’s core activities have been the implementation of over 1,000 small community upgrading projects and more than 100 larger and more comprehensive housing projects by poor communities, who organize themselves into savings groups and form joint community development funds with their local governments to support these community-planned and community-implemented projects. Through the process of carrying out these projects, and with the strength of their city-wide networks and coalitions behind them, the urban poor in these cities are gradually negotiating support from their local governments and local develoment stakeholders for an alternative, bottom-up, people-driven change process in their cities. ACHR is working with its key national partner groups to ensure that these interventions build effective, pro-poor partnerships within all these cities and to link them with both existing initiatives and ACCA-supported activities into a visible, large-scale, region-wide demonstration of alternative practice, to change discourse and practice across Asia. The ACCA Program is being used as a tool to support the work of these already-existing groups to help make that work stronger, more people-driven, more city-wide and more structural-change oriented. The ACCA Program’s primary mode of intervention is to offer these community groups funds which allow them to implement very concrete development projects as demonstrations, which follow this clear strategic direction. 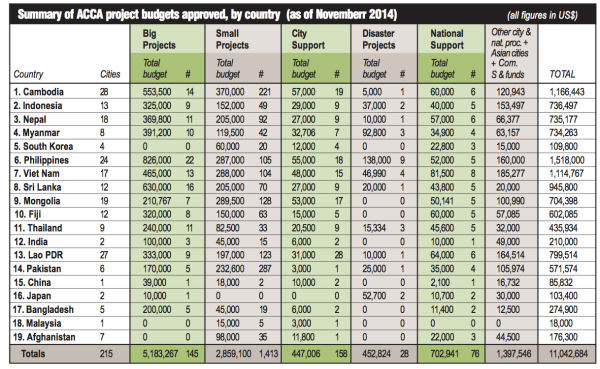 The projects already underway in 165 Asian cities and towns are opening space for implementing city-wide upgrading activities at scale. In all these cities, community surveys are being conducted to seed new city information systems, poor communities are organizing, linking and working together as networks, community savings groups and development funds are being set up and strengthened, and new partnerships with city governments and other local stakeholders are being nurtured. ACHR's latest report on ACCA process and projects is the best resource for people wishing an understading of the program. Want details of ACCA in one or 2 of the 19 countries only. GO to COUNTRIES (TOP menu) and click the country desired. Seven scholarly articles on the ACCA Program from the October 2012 issue of IIED's journal: "Environment and Urbanization"
The theme of the issue of the E&U Journal was "Addressing poverty and inequality - new forms of urban governance in Asia". About a year ago, our friends Diana Mitlin and David Satterthwaite at IIED honored us with an invitation to contribute a set of articles to this issue, all of which would look at different aspects of the ACCA Program. Since none of us are scholars or academicians, and almost all of us were terrified of the idea of writing a 6,000-word peer-reviewed article for a major professional development journal, we decided to use the strength of the ACHR network to gather the material for these articles and to meet David and Diana's challenge. A small workshop was then organized, in Bangkok, in December 2011, with some of the community leaders and friends from NGOs who are actually implementing these ACCA projects, to discuss how to go about documenting what we are doing and what we have learned. The participants broke into sub-groups to discuss what kinds of issues, themes, stories and breakthroughs from the ACCA process over the last 3 years they'd like to document in these eight articles, and who would like to help write which articles. After the sub-groups came back and presented their ideas, there was more discussion, and it was agreed that seven articles would be written about the themes below. All the articles were written as a collaborative process involving the ideas and inputs from many people. Together we are strong: networks, platforms and the social relations that support a people's process : The role of community networks and people's power changes. Assessing the ACCA Program: turning Asia's community upgrading initiatives into an open university : The learning, and knowledge creation through the ACCA assessment trips. The role of community architects in upgrading: reflecting on the experience in Asia : The role of community architects, professors, universities and para-architects in the ACCA process . 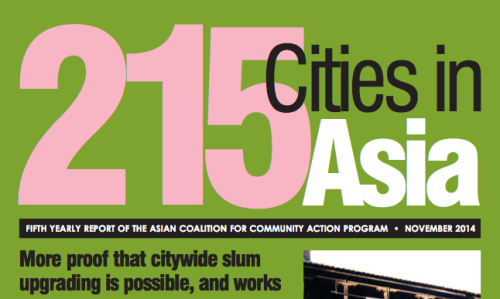 Change-making by urban poor communities : Catalyzing new strategies, policies and partnerships, how to change governments, and now ACCA is actually an anti-eviction strategy. How poor communities are paving their own pathways to freedom : Pathways to freedom and equality, how to unlock them through the process.